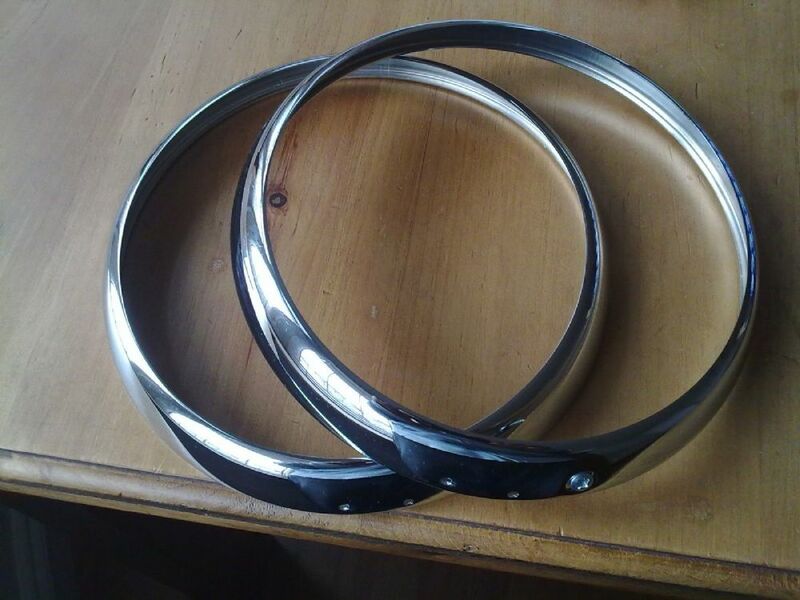 THIS IS A SET OF TWO BRAND NEW CHROME HEADLAMP BEZELS OR RIMS TO FIT THE AUSTIN A40 SOMERSET 1952-1954 AND THE A40 SPORTS 1950-1953 IMPORTANT ! THESE RIMS ARE NOT EXACTLY AS THE ORIGINAL IN THE FACT THEY DO NOT HAVE THE BUILT IN TIGHTENING BOLT AT THE BOTTOM. THESE HAVE THE SMALL HOLE FOR THE SELF TAPPING SCREW. THEY ARE FITTED ON MANY OF THE A40s STILL ON THE ROAD DUE TO THE FACT THE ORIGINALS ARE IMPOSSIBLE TO FIND. THESE ARE THE MORE SORT AFTER TYPE THAT ARE TRIPLE PLATED CHROME AS APPOSED TO THE CHEAPO REPRODUCTIONS AND NOT SO CHEAP REPRODUCTIONS ON SALE. FOR THIS SALE YOU ARE BUYING THE PAIR. CHECK OUT MY FEEDBACK FOR SUPER FAST QUALITY ASSURED BUYING. IF IN DOUBT ABOUT YOUR MODEL, PLEASE ASK.